The Decca Eloquence reissue of David Del Tredici’s Final Alice – see review – nearly made it to my list of picks for 2008 but the arrival of Jaap van Zweden’s Rite of Spring trumped it at the last minute. Final Alice was a landmark performance that needed to be resurrected and so too these Ansermet recordings from the 1950s and 1960s. There have been various couplings of these works in the recent past – some conducted by Martinon and Solti, for instance – so this all-Ansermet disc is very welcome indeed. Borodin took years to write his Second Symphony because he was also working on his opera Prince Igor. The symphony a stirring work, is not at all bad for someone who called himself a ‘Sunday composer’. The opening chords of the Allegro immediately establish Ansermet’s approach to this music; it’s weighty but not too hard driven and, compared with Ole Schmidt and the Royal Philharmonic on Tring TRP104 (nla), it’s a little untidy at times. That said there’s a distinctive flavour to the sound – it’s more tangy, more Russianate than the RPO can quite manage. And although this recording dates from 1954 it’s remarkably lifelike and visceral; the only downsides are the thin treble - especially on the strings - and slightly fierce tuttis. It’s a measure of the power and conviction of this performance that any doubts about the sound are soon swept away. In the Scherzo the pizzicato lower strings are very well articulated and even the brass has an apt Russian tubbiness that adds to the exotic appeal of this score. And while the Suisse Romande orchestra aren’t a first-class band Ansermet keeps them on their toes throughout. In particular I like the rhythmic vitality and ‘bounce’ of the Scherzo, which has more character than the RPO version. That said, the latter is rather more fleet-footed – especially in the strings - and, perhaps, more subtle in its colouring and rhythms. The lovely Andante, with its opening harp figures, is ravishingly played under Ansermet. It simply beggars belief that this recording was made more than half a century ago, such is its sense of presence, and in that spirit it’s easy to forgive the somewhat ragged brass playing. And those harps return at 6:14, sounding even more magical than before. One minor quibble, though; there’s a bad edit at the end of this movement; either that or it’s been faded too abruptly. The RPO are the better band but there are moments when the Swiss players conjure up some astonishing sounds. In the final Allegro, for instance, they deliver a real sense of momentum and vigour and the woodwinds acquit themselves very well too. The bass is necessarily curtailed and the cymbals sound a tad muffled but as before these caveats really weren’t enough to spoil my enjoyment of the piece. The helter-skelter dash to the finish – Ansermet very much in control – is particularly thrilling, rounding off a marvellous performance of this neglected work. The problem with the two-movement Third Symphony is that it was completed and orchestrated by Alexander Glazunov. The result is a little bland when heard alongside the Second; that said, there’s an authentic rhythmic flair to the piece, notably in the Scherzo. Recorded in Geneva in 1961, the Third certainly sounds smoother and more cultured, but what I really miss is the sheer verve, the sense of daring, that characterises the earlier recording of the Second. Still, it’s good to hear Ansermet’s take on this engaging piece. Glazunov also had a hand in finishing Prince Igor, the overture to which gets a somewhat rough – but exciting – performance under Ansermet. Again, Schmidt is subtler – more eloquent, even – but his more cultivated approach also robs the music of some of its thrust and thrill. Ditto the Polovtsian Dances, which the RPO play with considerable panache. Here the wide-ranging recording pays dividends, too, but one may be forgiven for wanting something a little more atavistic than this. The same is true of the Ansermet, which only really comes alive with those primal drum thwacks and transported cries - the latter omitted from the Schmidt recording. Now there’s that old verve again, and the sound is pretty spectacular for 1960 as well. Ansermet articulates those prancing rhythms to great effect and it all builds to a terrific chorus-capped finale. 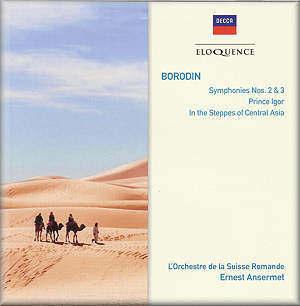 In the Steppes of Central Asia, a shimmering landscape etched in sound, shows Borodin at his most painterly. The colours are vibrant, the brush strokes broad, and Ansermet gives his orchestra a wide canvas on which to work. This is the most recent recording here – 1961 – and the sound is full and detailed. The strings may seem a little wiry but the general body of the orchestra sounds just fine. Not surprisingly Schmidt’s recording is far superior, with some lovely brass and woodwind, but again I was most impressed by Ansermet’s feeling for the music’s rhythms and colours. It’s a natural, spontaneous performance of a perennial favourite, and one that surely deserves a place in your collection. This is the first of the Ansermet Legacy discs to come my way and what a pleasure it has been. I have fond memories of Ansermet’s Swan Lake, which I cherished as a set of LPs, and I’m delighted to hear that many of the musicianly qualities I enjoyed there are present here too. Yes, the recordings are variable and ensemble untidy, but as an example of the conductor’s art this collection is essential listening.